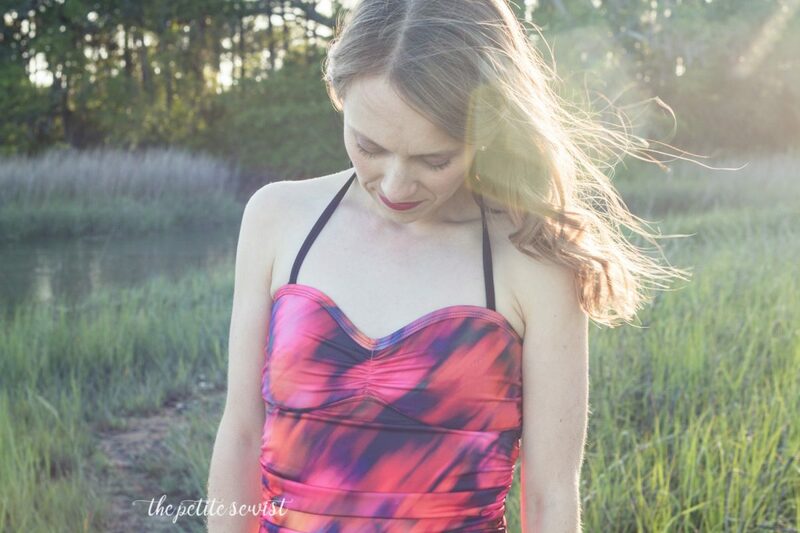 As part of #SewSwimSocial, I decided to sew the Jazz Swimsuit by SwimStyle Patterns. (#SewSwimSocial is a sewing challenge on Instagram. From now until May 17th, join me @thepetitesewist and @replicatethendeviate, @joyfulemon, and @crissybellsews for weekly giveaways and enter to win the grand prize by sewing a swimsuit! More details on our accounts.) This is my 6th or 7th swimsuit I’ve made for myself. If you can’t get RTW to fit or you want a suit in a fun print or style you can’t find in the store, making swimwear might be for you! Today I am really excited to show you my finished suit. This is a modified Jazz swimsuit. This pattern is really versatile: it can either be a tankini a one-piece or a bikini. I chose to make a one piece. I’ve been drawn to one-piece suits over the last few years. If it’s a two piece, I usually lose half of it in my drawer or it disappears in the wash. Also, after the birth of my daughter I have really enjoyed my swimsuit staying in place when I move! Leading up to this challenge I looked at a lot of swimwear patterns. I wanted something that had some detail at the bust and I couldn’t find anything new, until I stumbled upon Swim Style Patterns. This Australian based company specializes in swimwear patterns and they have so many different styles!! The fabric is a lovely abstract print from The Fabric Fairy, as is the lining and the elastic. I love the quality of Meghan’s swim materials! Please don’t waste your money on cheap and thin swimwear knits. 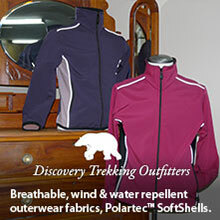 Quality fabric is so much easier to sew with and will wear well in the chlorine and salt. Want to learn more about sewing swim? See my post on the 10 BEST SECRETS FOR SEWING SWIMWEAR. When I initially was looking at the Jazz Swimsuit pattern I didn’t realize it called for cut and sew bra foam. I have heard of this textile before, but I associated it with bra making. Essentially, it is foam that is cut and shaped into a cup, to fit your body. I opted to do something a little different. Instead of using bra foam, I used some swim cups from an Old Navy swimsuit. I purchased the tankini top last year and it really didn’t fit me well. The cups were huge and the band was way too tight. I could barely breathe in it! But it was $6 so it came home with me and I hoped I could fix it somehow. 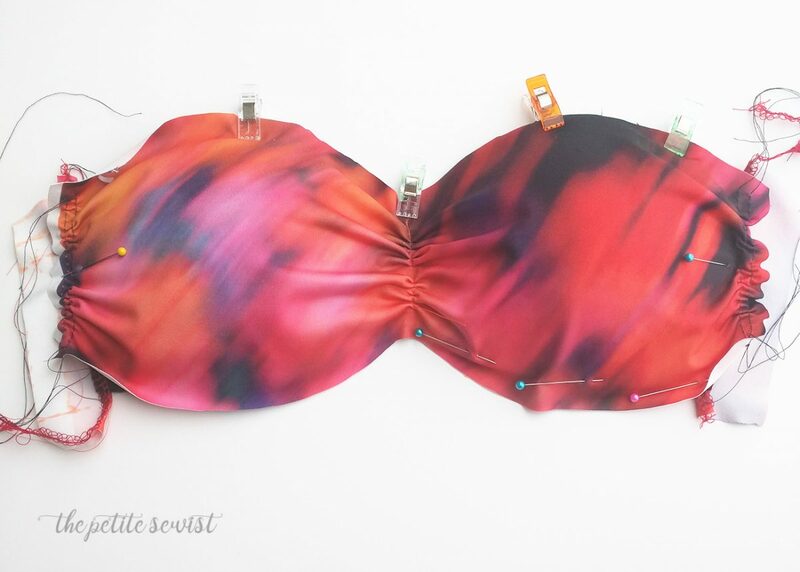 It was what actually made me want to make a swimsuit with molded cups, because I realized I would never be able to buy a swimsuit that fit the rest of my body and fit my small bust. I spent about 2 hours seam ripping these molded cups from there swimsuit. After that I had to figure out how to cover these molded cups with fabric. 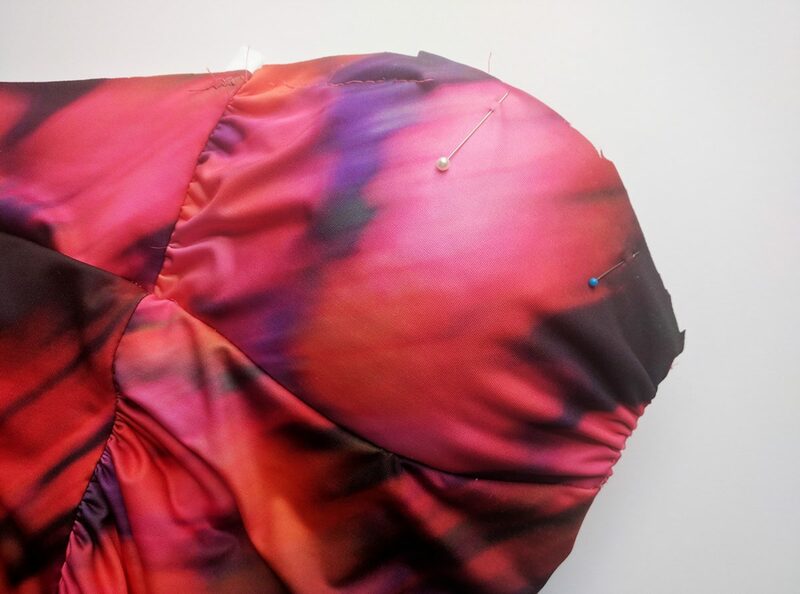 It took a few tries, but I eventually ended up with one piece of fabric that is ruched in the center of the bodice, and then ruched at the side seams. I absolutely love how it turned out! I should also mention that I had to cut these cups down quite a bit. Part of the reason they didn’t fit me in my original suit was that they were probably made for a B cup. I fitted then to my smaller bust by cutting them down at the lower edge. The torso pattern piece is straight at the bust seam, but my cups were curved at the lower edge. I redrew the top of the torso to be curved so that my cups would fit right into place. I cut out a size 8 and graded out at the waist. Changes I made for my 5’1″ height? Actually, none! And next time I would like to lengthen the torso by about 1/4″. (Although I’m sure this suit will stretch out with wear.) This pattern does not give measurements for girth, but since the top of the torso pattern is straight, it would be easy to remove length here. My advice is to baste the upper torso edge to your bodice, and then determine if you need to make adjustments to the height of the suit. The rest of the suit was a breeze! Ruching the front torso is such a fun detail! The ruching and the lining require extra ease. I made a muslin of just the lining of the torso and it was about a half a size too big. but when I made my suit with the ruching and the lining, it fit perfectly. When I got to finishing the edge of the top edge of the bodice I realized that I hadn’t left a seam allowance to fold over to the back side. No problem! I created a binding to go around the top edge and worked up the courage to finish it with my coverstitch machine. I probably should have done this with the leg holes instead of a zig-zag (sewn with the sewing machine). I have had problems using my coverstitch to topstitch elastic on swim before. I would sew an entire line of stitching and it would just FALL OUT!! So infuriating! I figured out the issue, though: I need to pull the tails of the thread as I begin the stitch. It locks the stitch in place. Also, I got a tip to hammer the thicker areas and I think it helped my machine go over them easier. Don’t you hate straps that dig into your armpits?! Before I sewed up the bra cups I moved the strap loops farther away from my armpits. One of the finishing touches was reattaching the same straps that were on my old navy suit. They matched so I thought, why not? I. LOVE. THIS. FABRIC. I went out of my comfort zone with this print. I usually go for more ‘safe’ blues for my suits. But isn’t it fun?! Life is too short not to have fun with your clothes! I’m impressed with this pattern. The grading looked good, and I felt it was sized really well. The instructions reminded me of some of the Jalie patterns I’ve sewn in that they are not ‘hold your hand’ type of instructions. (I prefer this.) This is an intermediate pattern. If you’re up for a challenge you will be rewarded with a fun and unique suit with lots of options! My friend and I shot these photos on the banks of the Wando River. It was a fun first attempt at back-lit/ side-lit photos and I had a lot of fun playing with them! A special thank you to Swim Style and The Fabric Fairy for sponsoring the fabric and the pattern!